Dr. Warren’s blogger articles on technology. 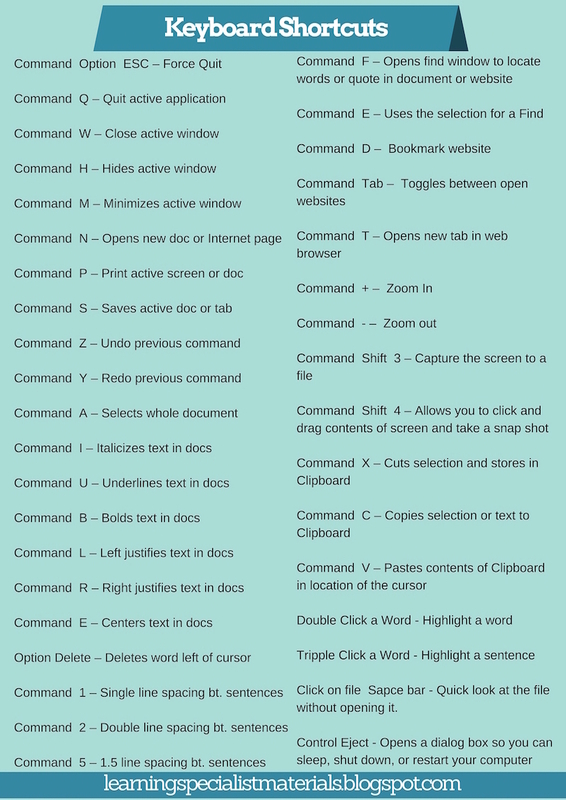 With busy schedules, keyboard shortcuts can save a lot of time and frustration. Committing a few of your favorites to memory is worth the effort, and I have also created an image that you can print so that these tricks can be posted beside your computer – when needed. Click on a file Space Bar – Quick look at the file without opening it. When working on your iPhone a double space at the end of a sentence will provide a period, a space, and will capitalize your next word. When taking a selfie, your volume button can also be used to take the picture. Ask Siri to open your apps, so that you don’t have to search for them on your device. On Google, when you type Define before a word, Google will provide a definition of the word. On Google, if you type in your flight number, you will get the gate, airline and time. On your phone’s camera, half press the shutter button to focus. Once you have done that, if you push down, it will avoid any lag. Any side button on your phone will stop it from ringing. With popup menus – to fill in the state, type the first letter multiple times to scroll through the options. I hope you find these tricks helpful! Voice Dream Reader and now the new Voice Dream Writer are what I believe to be the best apps out there for dyslexics as well as struggling readers and writers. I am so pleased to feature an interview with Winston Chen: the creator these Voice Dream apps. We focused our discussion on his recent release, Voice Dream Writer. Erica: If you had to put it into a single sentence, what is at the heart of Voice Dream Writer? Winston: It helps everyone write better. Erica: Why did you create Voice Dream Writer? Winston: Over the 3-year period during which I worked on Voice Dream Reader, my reading app, I became aware that reading and learning isn’t the only challenge facing students with dyslexia. Writing is as just as problematic. This was obvious from the emails that I receive from users. Beyond education, in the workplace, poor writing puts people with dyslexia at a severe disadvantage. I started to think about ways in which technology can help them improve the quality of their writing beyond dictation and word prediction. Erica: How does Voice Dream Writer help people write better? Winston: Three core capabilities. One, it incorporates speech throughout the entire writing process from typing to proofreading to help writers make fewer errors. Two, it has a sophisticated search engine for words that help improve spelling and word usage. Three, it has a synchronized outline that helps writers better structure and organize compositions. The goal is to help people write better, not fancy graphics and snazzy technical wizardry. It gets down to the basics: this magical but intimidating process of creating words and sentences on an empty screen. Erica: Were there any key people or organizations that helped to inspire the genesis of Voice Dream Writer? Winston: Many people gave me ideas. But I want to point out especially Landmark College, who encouraged me to develop this app, and Dr. Matthew Schnepps, one of the most respected researchers in the field and a dyslexic himself, who explained to me many of the problems that dyslexics face when writing. Erica: Who is your audience? Winston: The audience is precisely the same group of people who find my reading app helpful: adults and students with dyslexia, low vision, or blindness. These three groups have one thing in common: they do not process text the same way as the majority of the population does, and in particular they all value speech. Erica: What other apps have you created? Winston: This is only my second app. My first app is Voice Dream Reader, which lets people read with their ears. Erica: Are you intending on creating more apps? If so, what are some of your ideas? Winston: I always have a bunch of ideas floating in my head. For the foreseeable future, however, I want to focus on making the Reader and the Writer available on more platforms, such as Android and Mac. Two babies will keep me busy for quite a while. Erica: Can people learn more about your new app? Winston: Yes. The best way to learn more about this app is to watch the demo I narrated on my website: http://www.voicedream.com/writer. I want to thank Winston Chen for taking the time to speak to us! I hope you learn more about the Voice Dream apps and discover the benefits these valuable technology gems. Being a personal trainer for the brain, I am always looking for multisensory tools that can develop the different cognitive processing areas. A few months back, a saw a video promotion for OSMO and I was hooked. I preordered OSMO and recently received my materials. I’m happy to say that it has exceeded my expectations! OSMO is a wonderful tool that brings iPad activities into the real world. This new technology utilizes the space in front of the iPad to take games off the screen. The use of a base and a reflective camera, allows players to interact with three game-like apps. Drawings and physical objects are captured by the device and transported back onto the screen. The product also provides actual tangram shapes as well as letter tiles that can be used in the activities. Once the apps are downloaded, there is no need for the internet to play the activities. What Do I Get When I Purchase OSMO? OSMO comes with three, neat and well-designed boxes that magnetically snap together. One box holds the base and reflective device that slips onto the iPad. The other two boxes hold manipulatives for two of the games. Otherwise, directions guide the buyer on how to set up your own iPad by going to a web address and then downloading three free apps. The set up was quick and simple. Tell Me More About the Three Activities? Newton: This game develops spatial reasoning skills, visual-spatial abilities, and executive functioning. The object of this game is to divert a falling ball to one or more targets. Players can do this by first placing a piece of paper or a dry erase board in front of the OSMO and either drawing or placing objects onto this surface. These drawing or objects then appear on the iPad screen, diverting the ball to the target. Tangram: This game develops visual spatial abilities, nonverbal reasoning, fine motor skills, and executive functioning. Wooden puzzle pieces can be arranged in the playing field, challenging players to match images projected on the iPad. The game guides players through the process and slowly reveals a map of more difficult puzzles. Words: This game develops verbal reasoning skills, sequential processing and decoding abilities. Images are projected on the iPad to serve as word clues. Players can then place letter tiles in the playing field to guess the possible word. Players can play individually or they can compete against another player. The game gets progressively more difficult as play continues. Best of all you can upload your own words and images to make this game applicable to current academics. What a wonderful way to practice spelling or vocabulary words! 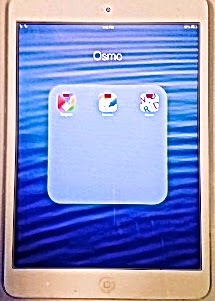 What About the Future of OSMO? The designers claim that they have plans to create more interactive games if the company grows. I can’t wait to see what they come up with next! OSMO has even caught the eye of Apple. Apple will be featuring it on their website. I contacted the company to ask whether I could create separate student profiles. It is not possible at present, but they said that they are already working on this feature and hope to release it soon. Where Can I View a Video of OSMO? How Can I Purchase OSMO? I would love to hear your thoughts about OSMO and learn about your experiences with this new, awesome device. When reading, do you ever find it difficult to track from one line to the next? This can be tricky for anyone when reading small text, but for many struggling readers, it remains to be a pervasive problem. In the past, students have used a finger, highlighter or bookmark to keep place. In addition, some Apps, such as Dream Reader, will even highlight a line of text or even individual words when text is read aloud. But wouldn’t it be nice to drop some of those tools and be able to visually scan text with ease? BeeLine Reader, offers a new, ingenious concept that can morph text on the internet and your electronic devices with the use of color. 1) What is the history of BeeLine Reader and why was it created? The idea behind BeeLine Reader is to adapt reading—which has historically been done on printed paper—for the digital era. Digitization has changed so many things about how we interact with written material: emails can be sent much faster than snail-mail, and you can fit a thousand ebooks on a handheld device. But despite these advances in the way we transmit and store written material, the way in which we ingest it is basically the same as it was on paper. Why is this? We never used to read in color on paper because printing in color is expensive. But on smartphones and tablets, color is costless. So the question becomes: is there anything you can do with color to make reading more efficient? The answer is yes, and this is precisely what our technology does. Our eye-guiding color gradients are designed to take advantage of the way your visual processing system works when you’re reading. This wasn’t possible—or at least practical—on paper, but on digital devices its a snap. We’ve created several tools that make this concept a reality, and in the last year readers all over the world have read millions of pages using BeeLine Reader. 2) Do you have your own personal interest in BeeLine Reader? BeeLine Reader started as an idea for making digital reading more efficient, but we quickly learned that it is much more than that. The reaction from the accessibility community—which we did not set out to target—has been tremendous, and it has changed the way we approach the technology. We have heard so many stories from people young and old who have struggled to read for their entire lives, and it is has been an incredible experience to work with them on products that have such a deep impact on their ability to read, learn, and work. 3) What populations are served by using BeeLine Reader? BeeLine’s technology is designed to help all readers, but it is particularly helpful for readers with vision impairments, dyslexia, and attention deficits. Vision therapists and dyslexia researchers are doing studies to better understand how BeeLine is interacting with various cognitive and visual differences to generate extraordinary gains for certain populations of readers. 4) What are your long-term goals for BeeLine Reader? Ultimately, we want to see BeeLine adopted as part of universal design and accessibility. Although BeeLine has potent benefits for the accessibility community, it is helpful for the vast majority (over 85%) of readers. Interestingly, it works in every language we’ve tried it in, and we have users reading in 100 languages. Given this broad appeal, the long-term goal is to have BeeLine integrated with many devices and platforms so that it can be used by anyone to read anything. 5) Do you have a testimonial that you would like to share? 6) Do you have any links that you would like me to use? Our website is www.BeeLineReader.com. Our free browser plugins are at www.BeeLineReader.com/install, and our PDF converter is at www.BeeLineReader/pdf. It might be worth mentioning that we’ll have an iPhone/iPad app released within a few weeks. People can sign up for our mailing list (on our website) to get updates on new product releases, scientific studies, etc. Being dyslexic myself, I have already been using the technology, and I couldn’t be more excited about spreading the word to my followers and associates. I want to personally thank Nick for reaching out to me and for creating this truly outstanding product. Audiobooks are wonderful learning options that make reading accessible to students with a variety of learning preferences as well as disabilities. For some time, they have been available at a cost on sites like Audible.com where books are read by actors or authors. However, they are often a costly choice that many can not afford. Luckily, free options on sites like Project Gutenberg and others are wonderful, but sadly they only offer audiobooks that are in the public domain. What about individuals with visual impairments, physical disabilities and learning disabilities that impact reading? Are there any options for this population of learners? only qualified individuals can use this service by requiring applicants to register as members and provide proof of disability. Who Can Certify a Disability for Membership? How Do BookShare and Learning Ally Compare? text to speech on the Mac, can really help with the editing process. your writing aloud. It uses computerized speech, but there are a couple voices that are quite realistic. How Can I Use This Technology on My Mac? Select a “System Voice” (my personal favorite is Alex), and pick a speaking rate by sliding the icon between slow-fast. preferred selection. Let me suggest using the control key and the letter s). to read and hold down the control key while selecting the letter S.
What Else Can I Use Text to Speech for? control key while selecting the letter s. You can also use this to edit your emails. I do it all the time. thoughts to interrupt the text content. will assist with sight word recognition. independently, and whole words recognition and reading speed will improve. their mind and that reading becomes far more enjoyable. online that offer books on tape. reviews the 10 visualization skills. 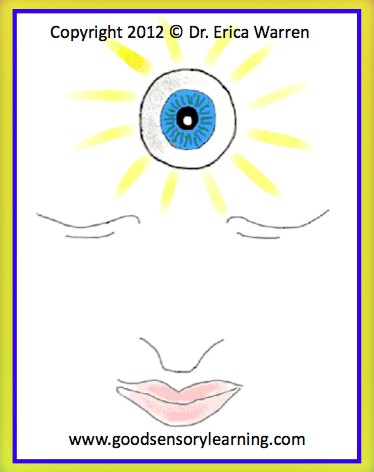 https://godyslexia.com/wp-content/uploads/2016/01/Go-Dyslexia-2-1-300x300.jpg 0 0 Erica Warren https://godyslexia.com/wp-content/uploads/2016/01/Go-Dyslexia-2-1-300x300.jpg Erica Warren2012-10-16 16:18:002016-01-02 23:34:21How Can Books on Tape Improve Reading Speed and Reading Comprehension?